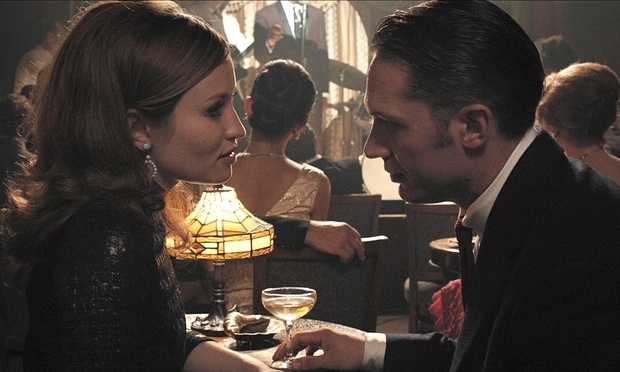 Gritty sixties biopic set in the back streets of east London, starring Tom Hardy in dual lead roles, with Emily Browning, David Thewlis and Christopher Eccleston. Legend is a fantasy, let’s get that straight from the off. It plays extremely fast and loose with the truth, deifies two brutal and extremely psychopathic nutters who briefly rose to notoriety in the sixties and shamefacedly ignores large chunks of the real story, with no real explanation as to why the twins turned out the way they did. It’s set largely around the time Reggie met and eventually married Frances Shea and focuses on the impact that relationship had on the brothers themselves as well as their close-knit family, the “firm” and on Frances herself. The movie is intermittently narrated by the hapless wife who desperately wants to settle down into some kind of normal life with Reggie, believing she can turn him into an honest businessman and move somewhere more respectable to raise a family of her own. Ronnie is the black sheep of the family, teetering on the edge of madness and tiptoeing the line between rage and paranoia on a daily basis, occasionally stepping into both territories to wreak havoc on everything and everyone around him. Reggie seems almost normal by comparison. In the beginning, Frances has a chance .. she can see the promised land and can almost touch the velour curtains. The brothers open a nightclub casino which is doing very nicely, thank you, and things are looking up: they’re making serious money without really needing to enforce their protection racket on anybody. She even persuades Reggie to take a break and go for a holiday on the south coast … which is when it all starts to unravel. Left alone and unchecked, Ronnie is having a ball with the club and by the time Reggie comes back it’s too late – everything they worked for has been destroyed by his psychotic sibling, hellbent on destruction almost to spite his brother. Almost? Most definitely in the eyes of the film-maker. On the face of it, this is a stylish and gripping drama that keeps you riveted till the end. Hardy gives phenomenal performances in both lead roles, the seething menace of Reggie as he tries to keep it together while Ronnie is going berserk beside him are both portrayed with just the right level of sneering malevolence and utter disdain. The visuals are seamless too, but then we’re decades away from “looking for the join” in anything like this. The period details are impeccable too, from the decadent American cars, the finely tailored suits and dresses, the music played throughout, as well as less obvious things like advertising hoardings and chalk boards outside shops. This is sixties London: you’re there. If you only take Legend on those terms it’s a fine movie. 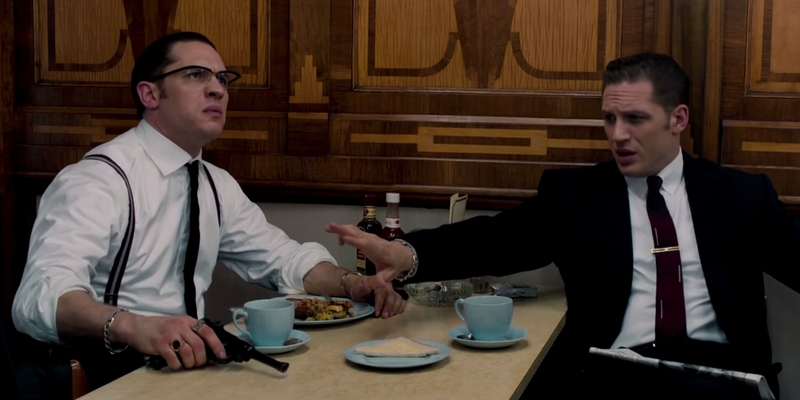 Everyone in the star-studded cast does a good job and the story itself is believable .. unless you know more about what the Krays were really like, of course. 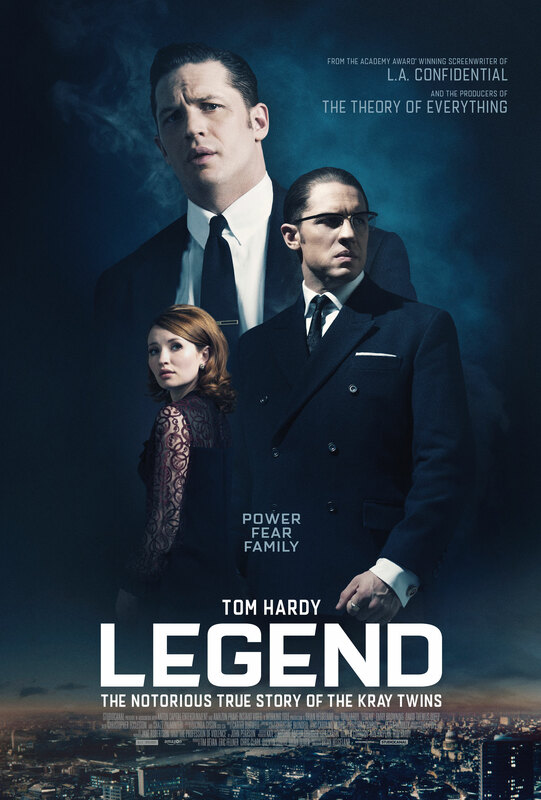 There’s too many differences between the fantasy and the grim reality to go into here and in that respect the previous movie starring the Kemp brothers was much closer to the truth : both Krays were bisexual psycopaths and neither could keep a lid on the other, while the mother, Violet, played a big part in The Firm and she’s barely even in Legend. 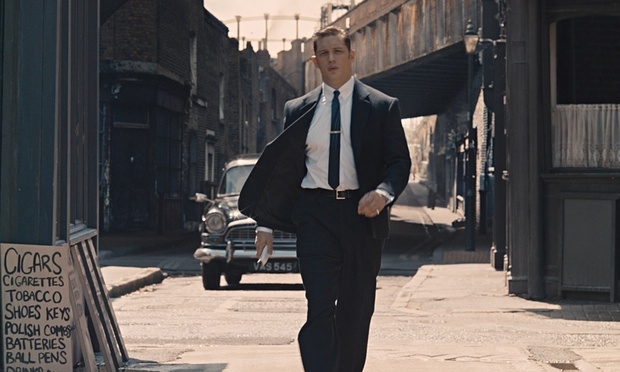 Legend does glamorise the Kray twins in the same way Straight Outta Compton made NWA’s members look like angels, but then history is written by the winners, isn’t it ? Even this review is biased to what I think of the movie. This entry was posted in blogging, Film Review, Media, Movies, observation, Opinion piece, Review and tagged biopic, crime, East End, eastenders, Gangland, Gangs, gangster, Gangsters, Kray Twins, Krays, Legend, legend film, legend movie, legend review, london, Mafia, police, Reggie Kray, Ronnie Kray, sixties, swinging london, thriller by rigger67. Bookmark the permalink.